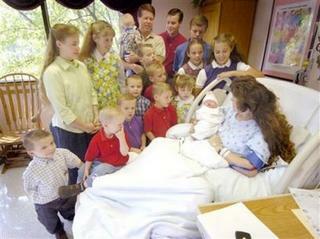 Michelle Duggar just delivered her 16th child, and she’s already thinking about doing it again. Johannah Faith Duggar was born at 6:30 a.m. Tuesday and weighed 7 pounds, 6.5 ounces. “We both just love children and we consider each a blessing from the Lord. I have asked Michelle if she wants more and she said yes, if the Lord wants to give us some she will accept them,” he said in a telephone interview. Johannah Faith,like all her 15 brothers and sisters, has a name starting with J. Robust population growth continues to sweep the nation’s Southern and Western states, according to estimates released Wednesday by the Census Bureau. If the trend continues at its current pace, states in the Northeast and Midwest that have been population powerhouses since the 19th century will lose their dominance to Sun Belt states by 2010. The 10 fastest-growing states — from No. 1 Nevada to No. 10 New Mexico — are all in the West and South. President Bush won nine of them in November. The exception was Delaware, ranked eighth. Delaware is classified as a Southern state by the Census Bureau. The Discovery Health Channel will re-run a special program on Oct. 19 focusing on the large family of former Arkansas State Representative Jim Bob Duggar, R-Springdale, and his wife, Michelle, who celebrated the birth of their 16th child earlier this week. The show originally ran when the Duggar’s had their 14th child.